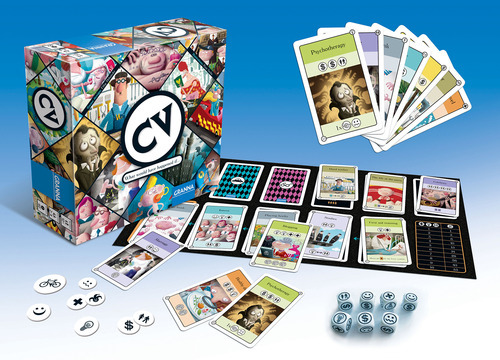 CV means curriculum vitae – your resume – and in the dice and card game CV you will lead a character through his entire life, making many choices about friends, relations, jobs and activities. CV or curriculum vitae, for those of you who speak latin, is the resume of life for a fictional character in the game. In this game by Granna games, you and up to three other people are allowed the chance to role the dice (not unlike trying to make the right decision in your real life) and try to put together the resume of your characters life as you might want it to be in a perfect world. Do you choose to work on building health, relationships, knowledge, career or are you all about the possessions. It is all up to you, or how lucky you are at matching the right symbols on the dice to the cards you want to add to your CV. The game starts by all players being given an individual life goal to keep hidden, then community life goals are laid out on the board-1 less than the number of players. Three childhood cards are then given to each player. You take one card, pass the remaining two to the next player, choose from the two new cards and pass the final card to the next player and these are your childhood events that you get to use once each to assist with a later turn, so use them wisely.Remember, you do have three more phases of life to get through, early adulthood, middle age, and old age, each with a unique deck for that phase of life. Did you get the shiny new bicycle as part of your childhood events, congratulations you are the first player. The rest of the game are played out in rounds, and there are phases in each round. Each player in turn will play out all phases of the round on their turn. 2-Reroll any dice you want to up to two more times, just like in Yahtzee, unless they have the frowning face (bad luck) face up on the dice, those are frozen and can’t be re-rolled. (see your mother was right, a face can freeze like that). 3-Once done rolling you may choose up to 2 cards from the board to add to your resume in front of you. Depending on which symbols (health, knowledge, relationship) you roll will let you know which cards you can buy using the cost at the top of the card. If you roll three happy faces (good luck) you may choose one card from the board as long as that card has no other criteria needed, this card also counts towards your two cards. 4-If you rolled three frowning faces (bad luck), you must discard one of your active cards from your CV in front of you. The top card in each stack is always the active card. 5-Add the cards you just purchased to your CV. Health, Knowledge, and Relationship cards can be added anywhere in those stacks, and Work and Possession cards must be added to the top of their stacks. 6-Clean up-move all cards on the track to the left and add more cards to the board to fill the empty spaces. At the end of the round, the left most card is discarded and everyone updates their bonus tokens (some cards give bonuses when they are the active card) Tokens are there to help remind what you actually have to use. Play then goes on to the next turn. At any time when a life deck runs out, game play stops and check to see if any player is eligible for social assistance. You are eligible if any other player has twice as many card in their CV as you. If this happens you may choose any card without paying its cost (must meet any special conditions). Game ends when the old age deck has fewer cards remaining than the number of players. Add points up and see who won. You score points for both the stacks in front of you, how many cards are in the health, knowledge and relationship stacks, and for their life goal. Possession cards are scored by victory points at the bottom of the cards. Then the community life goals are scored to the person who completed it best. Whoever has the most points wins, ties are broken by who had fewer cards in their CV to win. Components are pretty good, cards are sturdy with some fun artwork, tokens are poster board thickness, the dice I worry about as the symbols are screen printed on the faces, and not engraved. This is a fun little game that I feel does have some re-playability. It is a game bases mostly on the luck of your dice rolls, so that can be frustrating if dice hate you. Great game for family gamers and social gamers, also for avid and casual perhaps, other gamers will might want to stay away from this title. This game walks you though a life cycle from childhood though retirement. It is a card and dice game revealing a set of cards you may chose form to effect your current position in life or accumulate possessions for end game scoring. There are 3 phases of cards. They are youth through first job, midlife and retirement. The game play allows you to make choices about choices about possessions, friends, relations, jobs and activities. The dice roll is based on the Yahtzee style dice re-rolling of custom dice. It introduces a degree of luck but most dice rolling does. The game is good for all ages and I have played it with 2,3 an 4 players. It works well with any number. Pure strategy players will not enjoy the randomness but all other player types should enjoy the fast paced play. You need to plan for the future like in real life and changing occupations may affect the bonus dice you get from different positions. This game could be used for a intro game for new gamers. I love this game and try to bring it to the table as often as I can. Aujourd’hui, on se pose des questions existentielles! Si vous étiez devenu rédacteur pour Wikipédia lors de votre adolescence? Si vous vous étiez marié? Si vous aviez gagné le gros lot? Si vous aviez investi dans un fond de pension? Si vous aviez obtenu un doctorat? Si vous aviez eu des jumeaux? Si vous aviez été un fervent activiste? Vous aurez la réponse en jouant à CV! 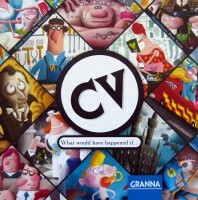 Add a Review for "CV"